Here’s part 2 of last night’s light Japanese dinner. But first I have to tell you about this left over stew I made tonight. After eating Tacos Al Pastor for 2 nights, I was getting bored with them, but I still had almost half of the roast left. I felt like something a little saucier tonight, so I fried up some garlic and onions, cut the roast into big hunks and added it to the onions with some remaining marinade, cumin, half a can of diced tomatoes and some water. Twenty minutes later I had a delightful “Mexican” stew with big chunks of moist tender meat and an unctuous sauce redolent of chiles and garlic with a mild sweetness coming from the pineapple in the marinade. I served it with some sliced sweet onion, cilantro, limes for squeezing and warm tortillas. I didn’t take any photos because I was thinking “how good could leftover stew be”, but honestly I enjoyed the stew more than I did the tacos. I don’t think I’d ever make a roast just to make a stew, but the next time I make the taco’s I’ll be sure to make extra to make this stew. Not only did the roast meat add an incredible flavour to the stew, it was also much more moist and tender than a typical braised dish. Okay back to the eggplant from last night. This is a fairly typical Japanese dish you’d get at an Izakaya (Japanese tapas bar). 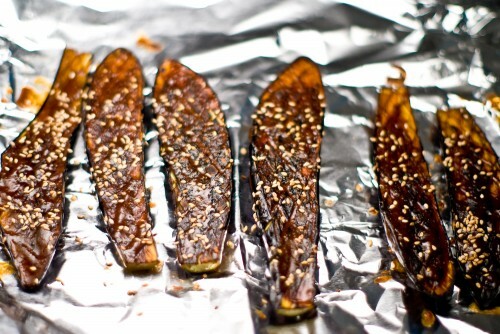 The eggplant is grilled to bring out its smokey flavour and the miso sauce enrobes the eggplant adding a well balanced sweet earthy flavour of its own. Putting it back under a broiler for a minute caramelizes the miso sauce adding even more depth. It’s great as an appetizer with some beer or as a main with some hot white rice. This recipe makes way more sauce than you need, but it keeps well in the fridge and can be used on all kinds of veggies or even firm tofu. If you want to put it on meat, make sure you start the meat on the grill first as the sugar in the miso will burn if you put it on too soon. For the sauce, whisk the dashi, sugar, mirin, miso and corn starch together. Heat over medium heat stirring until the sauce thickens. Take it off the heat and add the yuzu whisking it in to the sauce. For the eggplant, slice them in half lengthwise and score a criss-cross pattern into them to help retain the sauce. 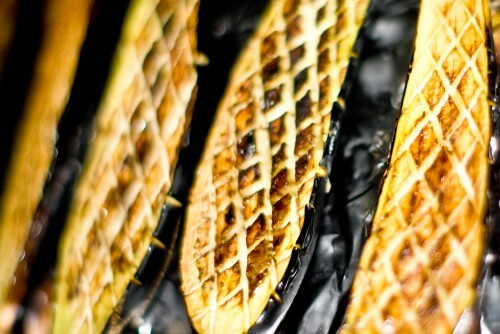 Brush with oil and grill on a BBQ or under a broiler until the tops are a dark brown and the eggplant is cooked. Give the sliced sides a good coating of sauce, sprinkle with sesame seeds then put under a broiler to get a little caramelization (be careful, this sauce will burn quickly). Serve immediately with some rice.